Is your house driving you crazy because it’s dirty? Maybe it’s time you follow some cleaning tips that will actually help get your home clean on a daily basis. I am the worst at keeping up with my household “chores” that when I do finally clean, it takes WAY longer than it should. This article is more of a “Do as I say not as I do,” since I am definitely a house cleaning expert. Though, I know that with a routine and a plan, my home would be in tip-top shape always. I blame having two dogs and a toddler for the mayhem in my living room and family room, but I just need to schedule time to make sure my house is clean at all time. These easy tips should help inspire you (and me!) have a cleaner house in half the time. 1. Pet Hair. One thing that is probably driving you crazy in your home is pet hair. I have two large dogs, so I know how this feels. You can get rid of pet hair by using duck tape or with a wet rubber glove. Unfortunately, this is probably something you’ll need to do on a daily basis to get rid of pet hair. I always have a lint brush handy in my handbag or my car. 2. Limit Distractions. How many of you can’t get any cleaning done because you’re distracted? Try cleaning to the tune of one song at a time. For example, clean the kitchen for the duration of one song so you can stay focused. <— This is a very EASY and actionable idea! 3. Get Creative with Storage. Not everything has to be in a perfect and beautiful spot. Get a little creative with your storage. Use a shoe organizer on the back of the pantry door if that helps give you more space. Creativity is where it’s at when it comes to storing items. It’s a Keeper updated her linen closet space, I use mason jars to keep my bathroom organization in check, and regularly declutter your garage. 4. Scrub the Floor. Your mop isn’t getting the floor as clean as it should. Take some old socks, put them on your feet and hands and go to town on cleaning. Scrubbing the floor can be fun and you can even involve the whole family when you do it this way. Scrubbing the floor by hand helps get it cleaner than ever. 5. Do Things Quickly. Not everything in life allows for you to do things quickly. However, cleaning is one of those things that does not need to take hours to do. Don’t draw out the chore, just do it as fast as you can. Set a timer and challenge yourself if you have to. 6. Clean as You Go. One major mistake people make when it comes to cleaning is to wait to clean everything at once. Instead of cleaning all at once, clean as you go. Take five minutes of your day in each room and watch how much of a difference this makes. When you wait to clean everything at once, things pile up. This is why my weekends are spent cleaning since I didn’t space it out throughout the week. 7. Clean the Outside of the Windows. When was the last time you cleaned those outside windows? It could be why you can’t get the streaks out of the inside of your windows. Make sure you take a couple of hours each month to clean the outside windows as well as the inside. 8. Don’t Stress. The more you stress about cleaning, the harder is can be. Relax and you will get everything cleaned that needs cleaned. There’s no sense in stressing yourself out about it more, so you end up getting nothing done in the end. These tips to avoid housecleaning guilt will make you feel better about the state of your home. Give yourself grace and realize that not EVERYTHING has to be crossed out on your “to do” list. 9. Use the Right Cleaning Supplies. Cleaning is hard when you don’t have the right cleaning supplies. Make sure you shop for the cleaning supplies you want and need to make your cleaning life a lot easier. I hit up the Dollar Tree for the essentials, and I fill in the gaps with items on sale at Target, Walmart, or Publix. I always have Clorox Wipes on hand, Swiffer pads, Febreze, and an all-purpose cleanser. 10. Schedule Cleaning Time. If you’re anything like most normal people, you need to schedule an event to make it happen. If you have been putting off cleaning, then it’s time to schedule “cleaning” on your paper and electronic calendar. This blogger even has a laundry schedule. If you’re heading out of town on a vacation, make sure to use these house cleaning tips for vacations. 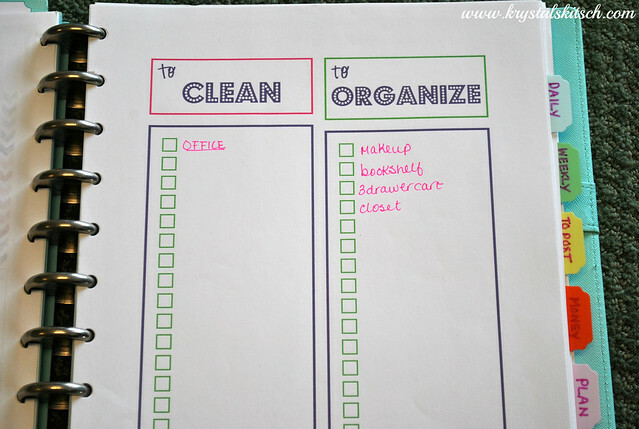 Use a home management binder to get organized. I love using Mama’s Got It Together printables in my discbound planner to stay on track. Hopefully these cleaning tips help you get things under control in your home. What cleaning tips would you add to this list? Get your house organized in a hurry with these ten easy house cleaning tips. Or hire a cleaning lady! Haha – kidding. I love all your idea, especially the one about scheduling time to do it! This is a very useful list! I admit I have trouble with dusting the most. And I dread whats coming when we get a dog for my son in September! These are some great tips! Thanks.. I always have distractions with cleaning.. but they are in the form of a 6 year old and a toddler.. lol! Love the old sock idea. I hate doing the floors and the mop never gets it clean. One I learned today? Put your cords back in the same place every time. Get a cute little basket, and use it! I have a dead camera battery to prove my point! Needless to say, my camera is now charged, and the cord is back where it belongs! These are all great ideas! I really try to clean as I go and I very rarely clean the entire place all at once. I usually start with the bathroom and work my way out. In three days, the whole place is done. No stress and no need to work myself to the bone either. This is actually a really great post as I was thinking the same thing as of late. I need to do another purge of my house. Distractions is my biggest problem. It seems like I will get in the zone and then I get a phone call and then it’s gone. These are great tips! The pet hair is what gets me the most! Great advice. I do tend to get distracted now and then but try to do as I go. I’ve just gotten used to the idea that my house is never going to be 100% clean and stay clean for more than a day. Great tips though. I have a lot of dog hair – I will try the rubber glove. I totally agree dog hair has to be dealt with daily. Pet hair is big in our house with 2 dogs and a cat. I have hardwood floors so some days I just use a swiffer like mop to gather all the pet hair. Other days I bust out the vacuum and go on a frenzy cleaning every nook and cranny. Great tips! I had to chuckle at the floor scrubbing one, imagining myself on all fours. I guess that’s one way to get the floor clean and get in a good workout as well! You called me out! I get distracted all of the time when I’m cleaning. This is sooooo me! Great tips! I do love cleaning to music, it makes the cleaning go by faster and yes, I get less distracted. And don’t stress – that’s a good one. Cleaning as I go is such a timesaver for me. Just carrying a load of laundry through the house when I’m going from the blog to the bathroom can get rid of all the laundry in just a few minutes. I’ve never thought to schedule cleaning, but it does make good sense. Thanks for the tips! I am a huge fan of the clean as you go. It takes less time and leaves less of a mess. In the long run, there is less to take care of. Great tips, Krystal! Now I just need a magic button to push that motivates me! 🙂 Thanks for linking to some of my cleaning ideas! Clean as you go is my motto. I don’t like to let dishes sit after we eat. Even when we cook, we clean as we go. My biggest pet peeve. Great tips and most of them I think I do. I am the Queen of Clean according to my husband, LOL. I do absolutely clean as I go. That especially comes in handy on days that unexpected company shows up. I do have a cat and a dog and they leave their hair everywhere. Never knew about a wet rubber glove for that. Great tips, thanks for sharing. Now I just need to schedule time to do it. Sorry to hear you find the window cleaning process to be such a pain. At least the list above gives you the option of getting the windows over with once per month. Great tips! I am so horrible at cleaning that it is ridiculous. We have a bi-weekly cleaning lady but the house could still use more tidying up from time to time. Great tips. I definitely try to clean as I go. I hate having a messy house, but as a single mom with 3 kids sometimes it is hard to keep up. I put off chores all the time, but once I get in the groove, I really enjoy doing them because I know the purpose. These great tips will help me be more productive! That’s a great attitude to have (though I wouldn’t expect anything less from The Positive Mom)! Cleaning with Purpose… I like it. I love these tips! I’m going to try tip number 2 especially. I love that idea to wear some old socks to help scrub the floor. I will be trying that. LOVE cleaning and tidy house!! It is really tough to maintain house, especially with small kids. I found all these house cleaning tips easy to do… I need to get started on my home cleaning NOW! thanks a lot for inspiration! Great tips Krystal, I agree that we should have cleaning time. As mom, I let my kids be involved and give them some house duties so as early as possible they can know their responsibility. Hiring a cleaning lady can cost me more, so as a housewife I’m the one doing all the household chores but I find it stressful, but as I read the list of your tips I learned a lot. Thanks Krystal!! This are great tips in terms of keeping house clean and organized. I love that you included the tip about cleaning time schedule. It really makes a great difference. Tip #6 is my favourite. I do it every time and it’s really crucial to fast cleaning. Thanks for sharing everything was very helpful to me. I like what you said about not drawing out the chore. Cleaning is something that needs to be done with focus. The more you focus the easier it is to go quickly. This is a great tip. Thanks for sharing. I agree that you shouldn’t stress cleaning. You really have to have fun with it or else it will be so miserable. These are some really great tips. If you do it fast, it will be over before you even know it. Nice Tips! I also organize laundry supplies into fabric bins or boxes, which makes the laundry room clean and easier to navigate. Great tips. I really enjoyed your post and thanks for the tips! Really nice blog and I have been looking for a way, other than essential oils, to deal with mold/ mildew. I will surely suggest these tips to my wife. Great tips,although all tips presented above are useful but Limiting distractions & getting creativity with storage is the best idea in my opinion.I will follow it definitely.Thank you very much for sharing! Two dogs and a toddler can make cleaning more difficult for anyone. With that said, you have so many great tips here… From cleaning as you go, to using a song to clean one room, to using creativity with your storage choices, you made cleaning sound a lot more fun and manageable. Don’t stress about cleaning.Following proper schedule,cleaning at regular time intervals or using your favorite cleaners can make it much easier & interesting.Article represents very interesting tips & ideas.Thanks for posting! This is really a great read, from pet hair and storage organization, your all point are awesome to follow, thanks for sharing your valuable thoughts about cleaning on your website. Now, I probably need to check the Mama’s Got It Together printables.